1 Select "Network Scan Server" in the "Start â†’ Programs â†’ VistaScan32" program group. After running "Network Scan Server", the scanner sharing service has been opened. 2 After running the "Network Scan Server", a "Network Scan Server" icon appears in the Windows 98 status bar at the bottom of the screen, and the network name of the current machine (Scan Sharing Server) is displayed in the icon. 3 Right-click the "Network Scan Server" run icon with the mouse, the "Program Control Selection" menu will appear, select the "Close" option to terminate the sharing service; if you want to automatically turn on the scanner sharing service after the computer starts, you can Select the "Start with follow-up window" option in the "Select" menu. 4 When the user machine uses the local scanner, the "remote source" will show the usage of the user's machine, but only one computer in the network is allowed to use the scanner at the same time. 1 In the "Start â†’ Programs â†’ VistaScan32" program group, select "Network Scanner Administrator" to open the "Network Scanner Administrator" main screen. 2 In the Scanner menu of the Network Scanner Administrator window, select the User Name Settings option. 3 In the "User name setting" dialog box that appears, enter the "identification name" of the machine in the "User name" input box of the "User name setting" dialog box. You can use the network registration name of this machine. There should be no computer with the same name in the network. 4 Press the OK button to return to the Scan Manager window. Select the Connect Scanner option from the Scanner menu and enter the scan server name in the Scan Server Name input box. If you do not know the server name, you can press the "Search Server" button to search, as shown in Figure 6. If the system cannot find the scanner server, check the installation settings of the unit and the server as described above. After all the above operations, you can use the network scanner, but in the specific application also need to set the scanner. 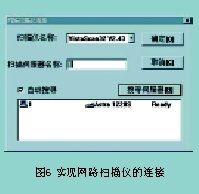 For example, in "Danqing Chinese Character Recognition System V2", you should select the "Scanner Settings" command of the "File" menu and select "VistaScan32/Network" in the dialog box that appears. In "Adobe Photoshop 5 (Chinese version)", the "Input/Select TWAIN_32 Source" command of the "File" menu should be selected, and "VistaScan32/Network" should be selected in the dialog box that appears. If you purchased a scanner driver that does not have network service capabilities, you can download the required driver with the manufacturer's website that provides an updated version of the driver or at the relevant website.